I learned several lessons that day. 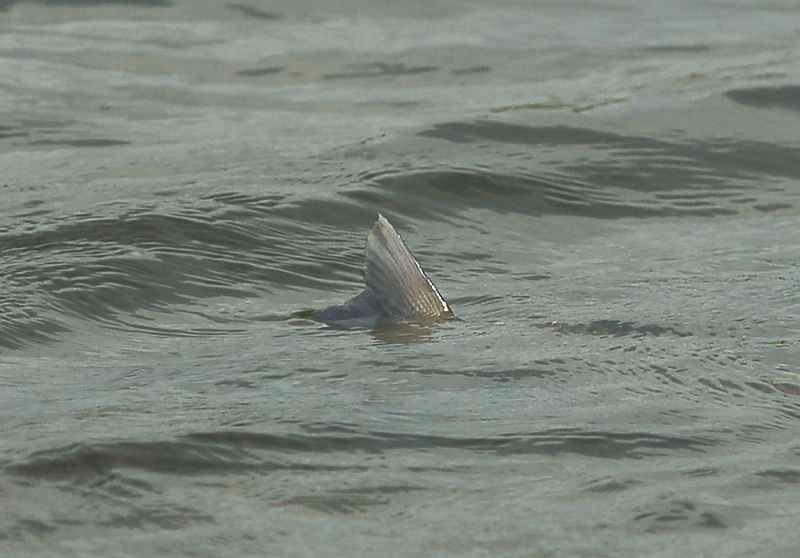 Perhaps the most obvious was the importance of distinguishing the tail of a black drum from the tail of a redfish. I have certainly committed that one to memory. 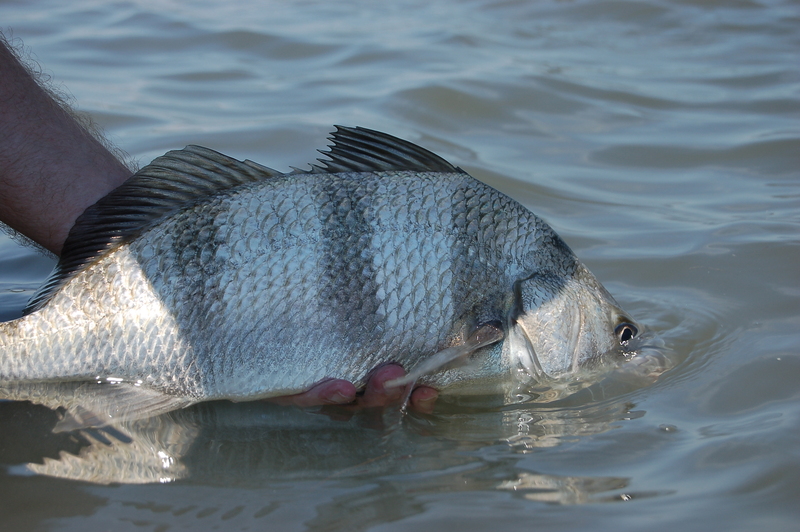 Although they are similar, a black drum’s tail is pale grey to creamy white with dark grey or black margins. It is slightly more blocky and less forked and wispy than a redfish’s tail, and tends to pop up and down when the fish is feeding. The second lesson I learned was that black drum are masters of camouflage. Their dull silver-grey bodies with dark vertical bands blend in perfectly on a muddy flat. 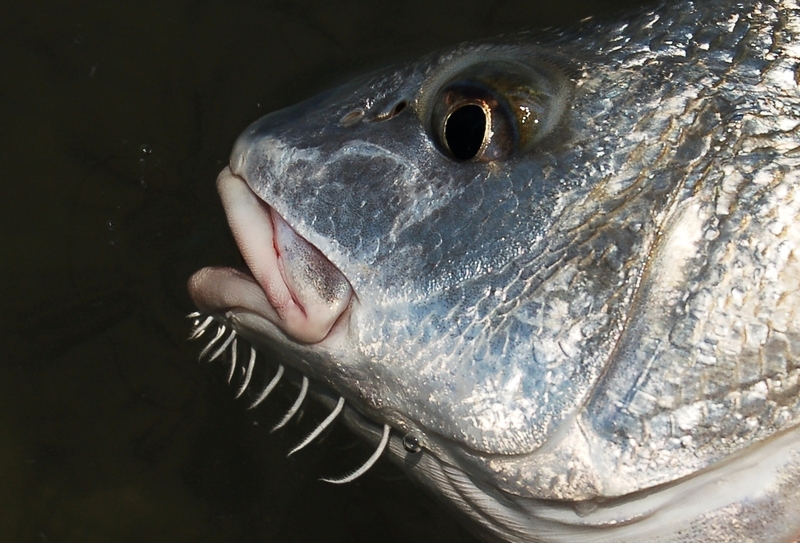 Drum will routinely lure you over with their bold tailing antics and then disappear seemingly under your feet. Because no evidence is left behind, it is easy to assume by default (or wishful thinking) the tail you just saw belonged to a redfish. Over the years I got good at busting the drum’s visual trickery, but I still had terrible luck actually catching them. I couldn’t help but wonder how a fish with a less-than-polished reputation could be so dang hard to catch (kind of like a carp). Casting at drum was like a ridiculous carnival game I couldn’t win. The prize dangled there and I was convinced if I forked over enough quarters I would eventually figure out the trick. But time and time again I walked away broke and frustrated. Then, I learned the most important lesson of all when casting to drum- presentation. Stick the fly under their nose. Drum fishing is a game of precision, and if you want to catch a drum on the flats you should worry less about what fly you are throwing and more about where you are throwing it. Unlike most other fish on the Texas flats, the black drum is a true bottom feeder. One look at their strange morphology will tell you this. Visualize a drum rooting his way slowly across a muddy flat. His tail is in the air and his head is stuck in the mud. His grubbing and fanning activity stirs up the water and limits visibility so he relies on his barbells and nostrils and sometimes his eyes to detect prey. Anything that smells or feels like prey within the narrow strike zone near his head (whether it is a crab, worm, shrimp, or even a minnow) gets eaten. If your fly happens to be sitting there and he detects it, he’ll bite it. But, if your fly is only a few inches outside this area, he’ll never know it’s there and you’ll go nuts trying to figure out why you can’t get a strike. Unlike a redfish, a drum usually won’t zip out and bust a school of baitfish or scattering shrimp. Likewise, he typically won’t bolt and nail your fly. He stays focused on the bottom, plodding along and feeling for food. So, just drop your fly on the mud where the drum is feeding, twitch it, and let him find it. Watch the drum’s tail and use it to determine roughly where his head is and what direction he’s moving. Try to drop the fly right in front of his head and allow the fly to sink to the bottom. When you think the drum is on it, give the fly several very short twitches or drag it a few inches. As soon as you see the drum’s tail dip or any other changes his in behavior that indicate a strike, set the hook. If you get no reaction from the drum, carefully pull the fly away and drop it on him again. Remember- the presentation is more important than the fly. So… will any old fly work? Well, some are certainly better than others. 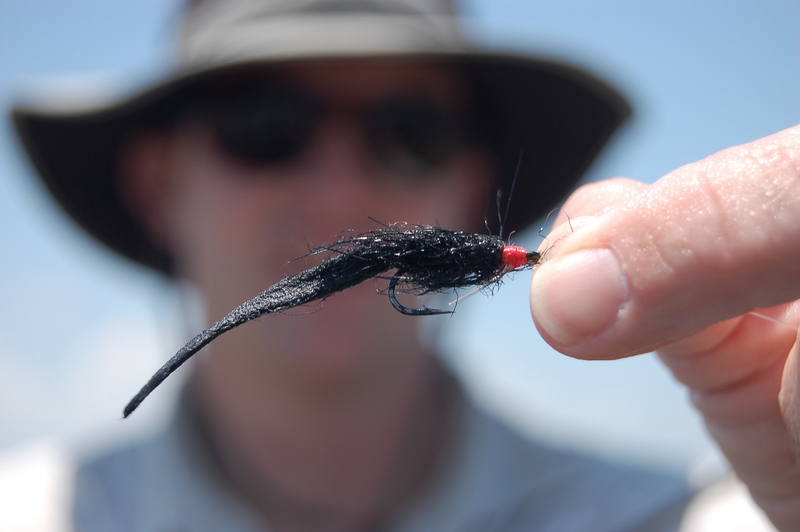 The best flies are those that are somewhat small, headache-free (weedless), and highly visible. Drum flies must be weedless so they can be dropped to the bottom and dragged slowly over mud and grass. Visibility is important because you are usually casting these flies into turbid water. Dark colored patterns, like black, purple, and brown are good choices. Another feature to consider is whether the fly materials are fluid. Fluid materials like craft fur, marabou, webby hackles, and rubber legs impart a lot of action to a fly. When you use these materials you’ll get the best return out of subtle twitches tugs and the drum will have an easier time homing in on your fly. 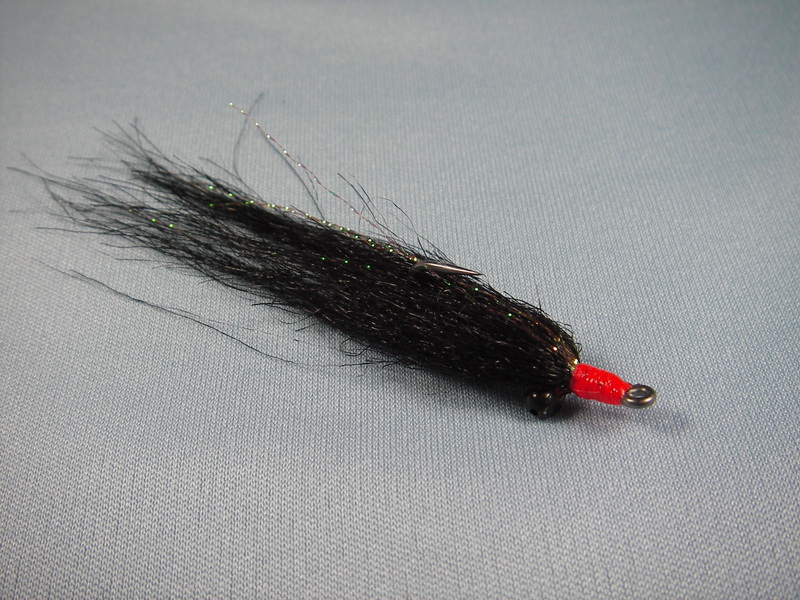 Three types of patterns I like are: 1) Wolly Buggers, 2) Craft Fur Clousers, and 3) Chamois Leaches. My absolute favorite is a Clouser/Charlie style fly I call a Chin Slinky. I tie these in black and use some orange thread or flash as a contrasting color. They are easy to tie, easy to fish, and the drum will eat them. 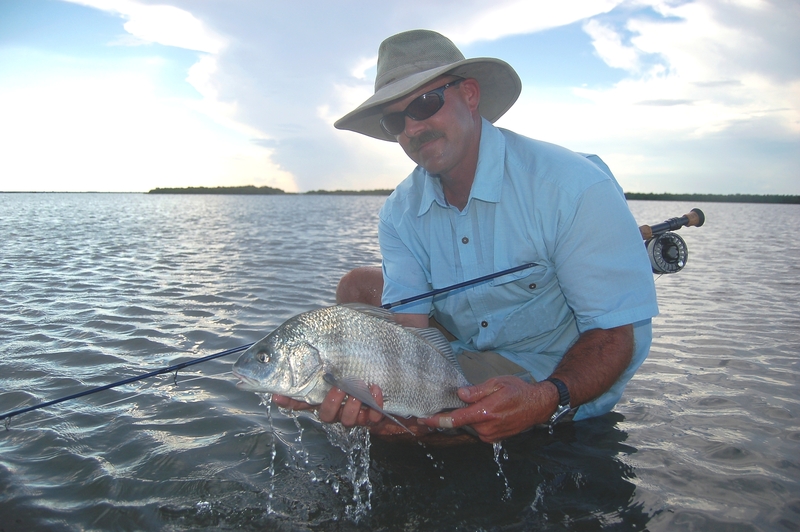 For average flats-sized drum (2 to 10 lbs) tie them on #6 black Gamakatsu Bonefish hooks. Again, there is nothing really special about these flies, but they do consistently work. Drum are savvy fighters and will make bulldog head-shaking runs when you hook them. They aren’t glamour fish, but they are very challenging to catch and that in itself is plenty of reward. If nothing else, casting at them is a great way to hone your skills. Remember- stick the fly under their nose and keep it there. You may discover you have been missing out on one of the gamiest residents of the flats.